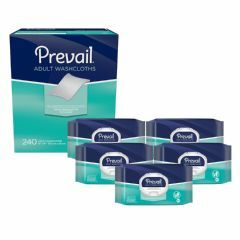 AllegroMedical.com presents The Prevail® Adult Washcloths which are made with Super Strong and Super Soft fabric. Single Hand Dispensing ensures that a single, unfolded wipe dispenses each and every time for added convenience and less waste. These washcloths are very handy to have either around the home or travel. Each sheet is moist, not wet, and will help you clean up with ease. Every durable sheet measures 12" x 8", and is designed not to tear or leave cloth fibers behind making your job clean and easy. Tri-Form Fabric: Super strong fabric that is incredibly soft. Each washcloth gently cleanses the skin while protecting the Caregiver from ripping or tear. Skin Smart® Fabric: This breakthrough material is made with Vitamin E and natural botanicals Aloe and Chamomile, known for protecting, soothing and promoting healthy skin. The fabric wicks urine quickly and locks moisture away from the skin even when the product is under pressure of body weight. Single-Hand Dispensing® Lid:By combining pop-up folding and a special lid design, a Caregiver with one hand, can pull a single unfolded washcloth each time without reaching in, adding convenience and reducing waste. Lotion Enhanced: Moisturizes skin to promote skin wellness.